Promotional value expires 90 days after purchase. Amount paid never expires. Not valid for happy hour specials. Limit 1 per 1 table for 2 or 3 people. Limit 2 for 1 table of 4 people or more. Limit 1 visit per day. Valid 5 p.m.-closing, Monday-Saturday. Not valid for special menus. Reservation required. Not valid on 12/20/18-1/1/19 (closed). Limit 10 per person, may buy 10 additional as gift(s). May be repurchased every 30 days. Limit 1 per visit. Valid for dine-in only. Merchant is solely responsible to purchasers for the care and quality of the advertised goods and services. 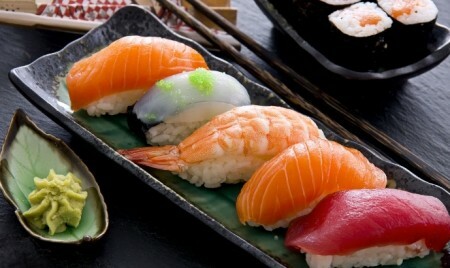 A deep green ribbon of seaweed wraps around pink pieces of salmon and grains of white rice. Bright orange roe pops against the inside of a baked oyster shell. The chefs at Koto Sushi Lounge decorate their rolls with these eye-catching ingredients, from sliced green avocados to bright yellow sauces and shaved carrots. The rainbow of colors also takes center stage in the modern dining room, a clean canvas of white walls, dark wooden furniture, and mocha-hued flooring. Other non-sushi dishes include a 10-ounce Alberta AAA steak and yam or oysters hidden in a deep-fried tempura batter.